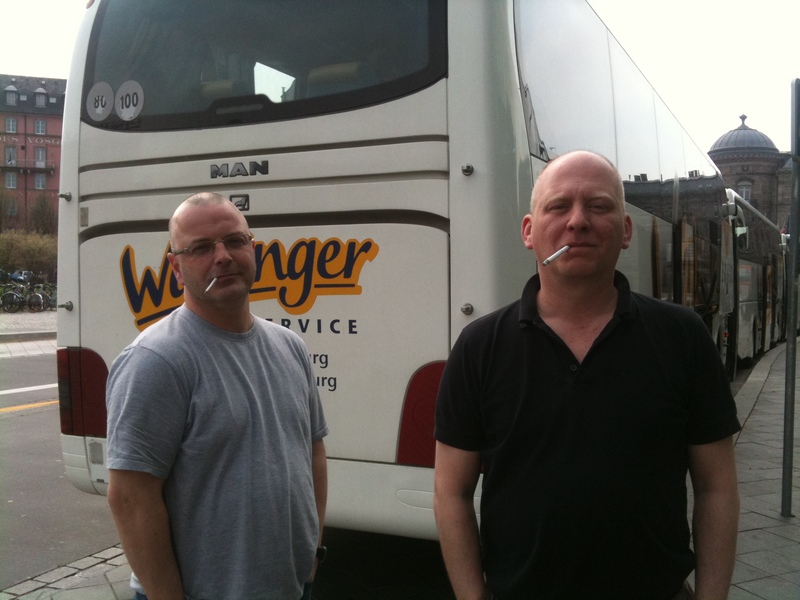 French horns Tim & Simon-the last remaining smokers in the RLPO! On Sunday the RLPO were Paris and traveling to Frieburg in Germany. At 10.30 we walked across from the hotel to Gare de l’Est to catch the train to Strasbourg, one of the homes of the administration for the European Union. We had a nice little compartment booked for a select few of us. 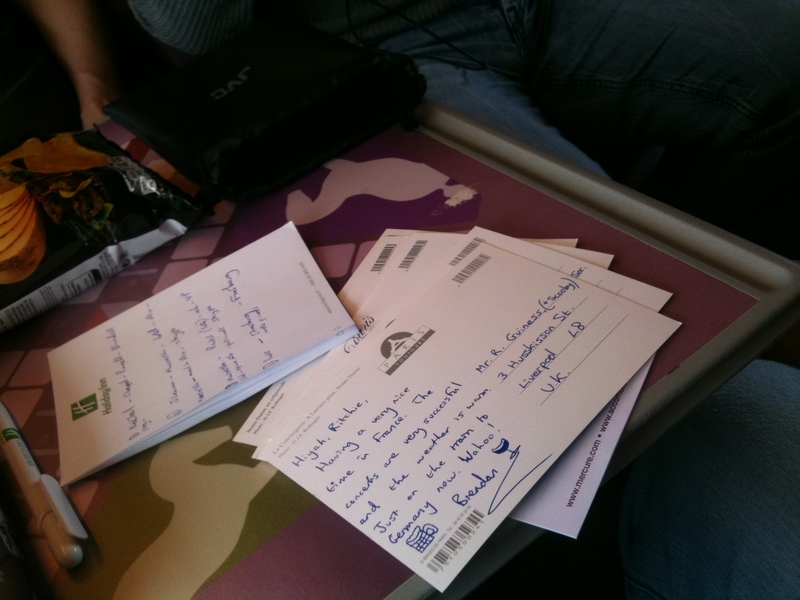 Call me old fashioned, but I still like to send postcards to those closest to me. This seemed as good an opportunity as any to crack on. Once there we were delivered across the river, which determines the border, to a brand new hotel in Frieburg: a short walk from the venue and the town centre. 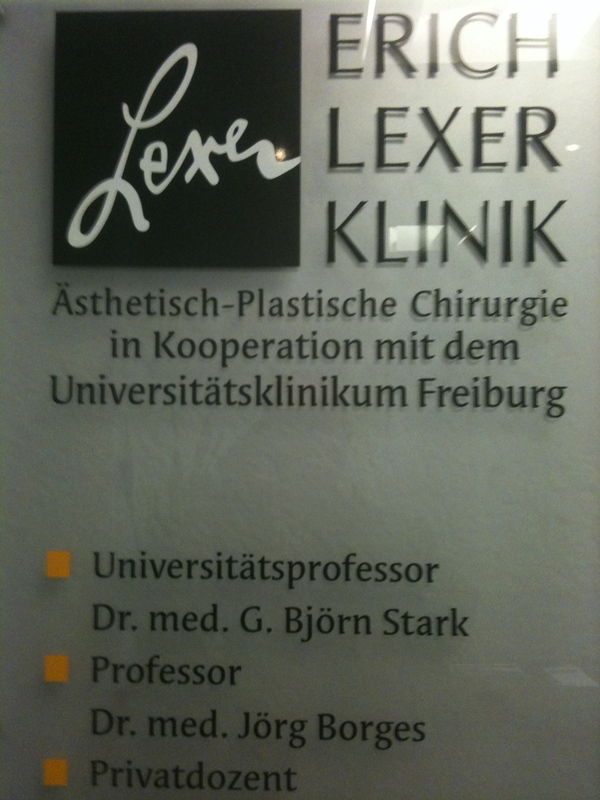 I thought it rather amusing that the hotel doubled up as an Institute for Plastic Surgery; that was something a little different. RLPO hotel doubling up as an institute for plastic surgery! It was a slightly drizzly day but many went into town to see the medieval minster and to sample the local food. There was also some interest from the Scottish contingent in the RLPO as Scotland were playing Brazil at the Arab Emirates Stadium in London; they lost two nil, sadly. The rest of us were collected by coach sometime later.I had been trying to get the internet to work, unsuccessfully in the hotel. The rehearsal went ahead and during the break before the concert, I made sure I didn’t go out of eyesight of the concert hall following the difficulty of the previous evening. I couldn’t help wondering to myself about all the extra investment that seems to go into concert venues abroad compared to the U.K. Each town we visit seem to have a state of the art, uniquely designed hall; with great backstage facilities and front of house amenities etc. Once again the concert was a sell out and the audience demanded an encore. This tour was proving a success! 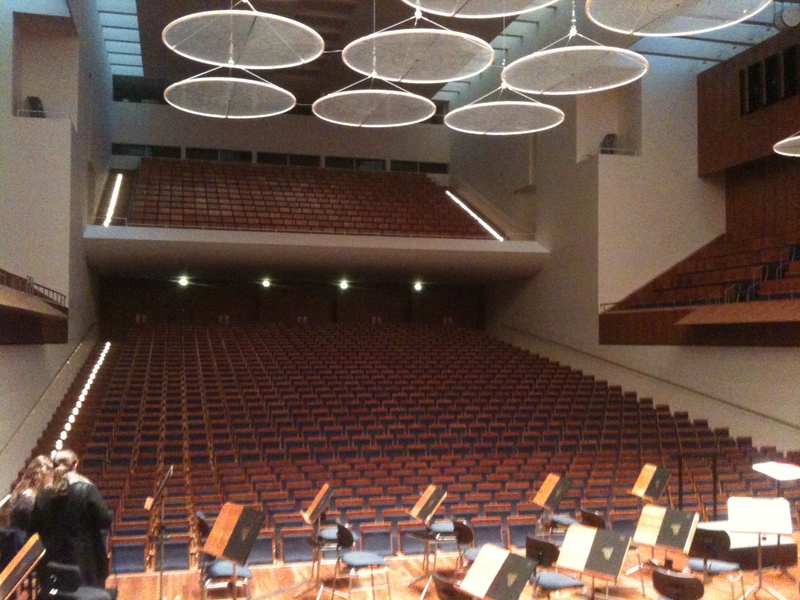 Concert Hall in Freiburg-note the acoustic dart boards! Post concert, many members of the RLPO hit the town to try the town centre’s famous two home brew pubs. I travelled back to the hotel to incur further difficulty with the internet and Skype. 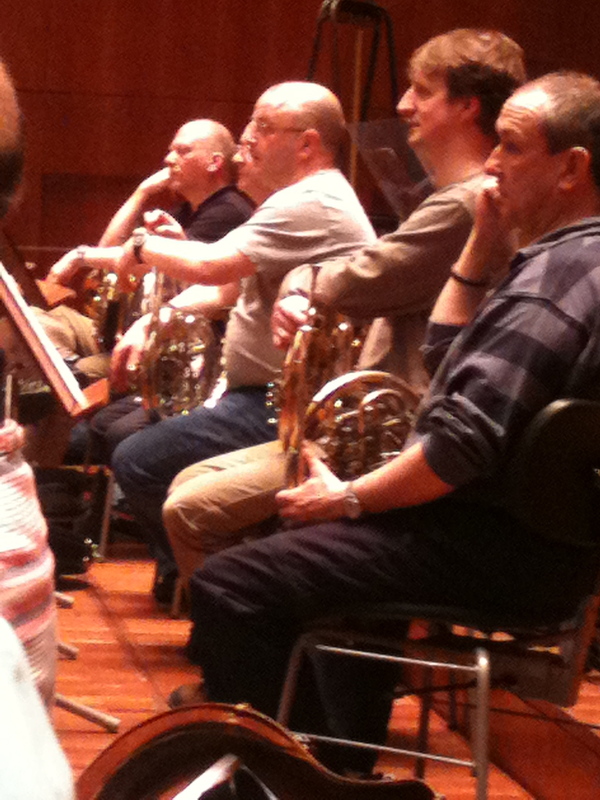 The french horns paying attention during rehearsal! This wonderfully fresh and aromatic sauce, when added to cooked pasta or just casually dolloped over your char grilled chicken, will lift your spirits higher than the leaning tower of Pisa. Rest assured ‘miei amici’ you will be singing louder than Luciano Pavarotti by the end of this meal! And here’s the best bit – it’s an absolute breeze to prepare. 2 good handfuls of fresh basil leaves – all the better if you have hands like Ray Clemence! A generous handful of pine nuts – I like to lightly toast mine! Tip all the ingredients into a blender (or food processor) and whizz! If you have a little more time, with the aid of a pestle and mortar, you could lovingly pound the basil, garlic, nuts and salt to a pulp then slowly stir in the oil and cheese but between you and me, unless you want to be sweating like a Chiuaua in a Mexican restaurant, I’d stick with the blender!